A few of us are perennials blooming all the time, a few more are late bloomers and the rest of us are just hoping to bloom someday. Another secret for those of us waiting to bloom is creativity, described by Connie Goldman in her book “Secrets to Becoming a Late Bloomer”. Many people view creativity as a rare talent that few possess which allows these gifted individuals to create beautiful paintings, songs or poems. But Connie decribes creativity in much broader terms, where everyday we have the opportunity to look at a situation with "beginner's eyes”; to see in fresh ways, with open and accepting minds. The photographer, Dewitt Jones describes it in a similar way: Everyday creativity is seeing the “extraordinary in the ordinary”. If you understand creativity in this broader sense, we all possess the ability to be creative. It is in all of us, and can be expressed in many ordinary ways: a hobby, a personal relationship or grand parenting. In all of these everyday situations we can see and engage the world with new eyes. You can nurture your creativity by engaging in something you enjoy doing on a regular basis. It is when you are doing something you love that your creative spirit opens up. But as in anything that is important, it’s not easy. Everyday remind yourself to look at situations, even the mundane, with fresh eyes and find the extraordinary in the ordinary. As Connie points out "Everyone knows that we can't stay young forever; yet we can stay fresh, alive, and aware." Last week was typical The Dalles: Hot! And I am sure the temperature will reach the hundreds again before summer is over. For those of you who do not have air conditioning, and need someplace to cool off for a while, you are welcome to just hang out, read some magazines or chat with new friends at the Senior Center. The Senior Center is always open during the day from 9:00 - 4:00, Monday through Friday. In the evenings we are also open for Wii Bowling on Monday starting at 7:00 PM, Music on Tuesday starting at 7:00 PM and Bingo on Thursdays and Saturdays starting at 6:00 PM. Plenty of opportunities to visit, have fun and stay cool. This next Tuesday evening July 22nd at the Senior Center our regular fourth Tuesday performers the “Jazz Generations” will be playing the big band music of the 20's through 60's for your listening and dancing pleasure. The action starts at 7:00 PM. Admission is free and donations are appreciated. All ages welcome. And tonight you have a chance to enjoy the fine talents of the local band “Stay Tuned” with Linda McAllister and Friends. The City of The Dalles has been a key supporter of the Senior Center from the beginning, twenty five years ago when the City donated the land and applied for a federal Community Development Block Grant that made the center possible. Thanks to their continued support, the city public works department re-striped the parking lot and painted the curbs. The parking lot now has a fresh look and folks can actually see where to park. Thanks to the generous donations, the Senior Center’s NU-2-U Shop is overstocked with nice used clothes. To move the inventory, Betty and Martha are going to have another $1 a Bag Sale this coming Thursday July 17th from 10:00 - 1:30. Great used clothes at below bargain basement prices. And keep you eyes and ears open. There may be a sidewalk sale in the near future. Fort Dalles Days are just a few bucks away. 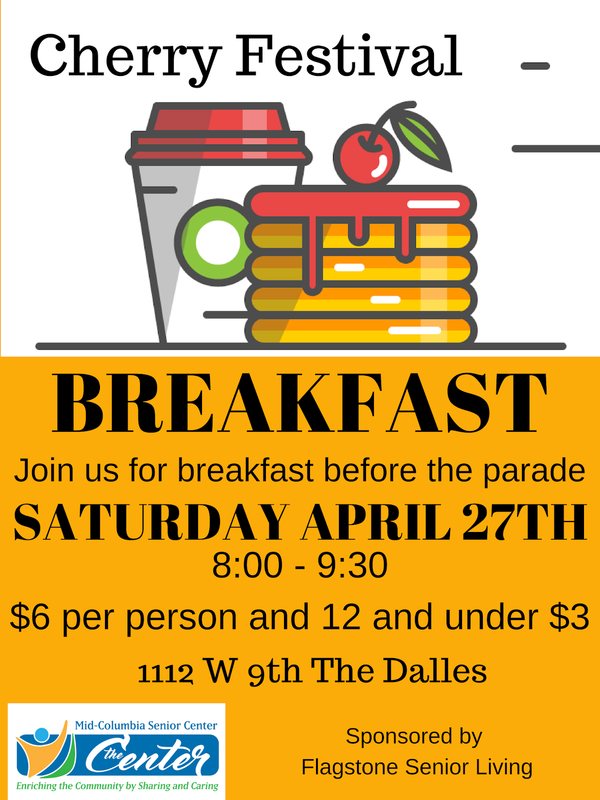 On Saturday, before you get ready for the parade stop by the Senior Center and enjoy a nice breakfast. This month’s menu includes Biscuits and Gravy, Sausage, Eggs and Fruit and the regular beverages. 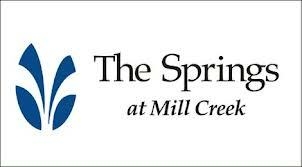 Breakfast is from 8:00 am till 10:00am and is $5.00 per person and $4.00 for Senior Center members. This Saturday’s Senior Center Breakfast is sponsored by Golden Key Real Estate in support of The Dalles Sister Cities Association. Every summer from five to ten students are selected to travel to Miyoshi, Japan as a part of the sister city exchange program. Before they go, they spend many hours learning about the Japanese culture and customs and a little of the language. It is quite an exciting and rewarding adventure. The trip is a great value but is not cheap. To help pay for their trip they will be helping to serve and bus dishes for the Saturday breakfast with tip jar out for any donations. So stop in, enjoy a fine breakfast and help support the Senior Center and the young ambassadors traveling to Japan this summer. The Mid-Columbia Senior Center’s has a new website. This website was designed by The Dalles Wahtonka High School seniors Hillary McKay and Olga Tolmachova while taking Mr. Felderman's Web Design Class at TDWHS. It still needs some fine tuning but it does have the weekly calendar, information about our partners, a list of Senior Center activities, a monthly survey and other information. I really appreciate the help from Mr. Felderman and his class. It was a nice example of seniors helping seniors. There is a great bunch of folks of all ages who show up Thursday and Saturday nights to play bingo and help support Meals-on-Wheels and the Senior Center while having a good time. The doors open at 4:30 and the first bingo game starts at 6:00. If you aren’t familiar with daubers and black-outs there is always someone who can help you get started. 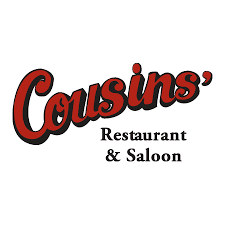 So come on in and enjoy a cool evening of fun. That is it again for another week. Until the next time, here is something to ponder.